1. Grate the lemon zest onto the rice and add 25g sugar. Bring the milk to a boil in a medium pan, add the rice and stir. Cook slowly, stirring occasionally, for 30 minutes. 2. Meanwhile, cut away the pith from the lemons then cut the fruit in half lengthways and remove the cores and pips. Roughly chop the fruit, reserving any juice. 3. Heat a frying pan, add the butter, 50g sugar and lemons. Cook over a medium high heat for 6 minutes, until lightly golden, then add the reserved lemon juice. 4. 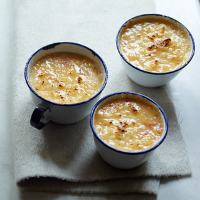 Stand the rice for 5 minutes then stir in the crème fraîche, followed by the caramelised lemon. Spoon into dishes and sprinkle a layer of sugar over the top of each. 5. Preheat the grill, then heat the puddings until the sugar has melted and browned slightly. Cool for a few minutes, then serve.